Fabulous Oceanfront Home, Amazing Views!! From late June to mid August this home books from Friday to Friday. Holiday Season: reservations that block both Xmas and New Year’s may not be accepted, unless they are 10 days or longer. These policies may be relaxed within 30-60 days of arrival. Please contact us with any questions. It just doesn’t get better than this! This home is located on the northern bluffs of Cayucos with sweeping views that span from the Cayucos pier to Morro Rock to Montana de Oro. The home is comfortably and tastefully furnished and immaculately maintained. The floor plan of the home optimizes the amazing views while providing lots of separation and privacy in the bedrooms. You will enjoy hours of relaxation on the private deck that ends at the ocean cliffs. Due to the potential danger of the cliffs, we do not recommend this home for groups with small children or impaired members. Special Terms and Conditions apply for this home because of this unique condition. •	Large wind-protected deck on ocean side of home that enjoys amazing views. There is a patio table and chairs and BBQ grill so plan on dining al fresco during your stay. •	Kitchen, dining room, living room create a large open area for your group to gather with a large screen TV, fireplace and amazing views. •	Well-stocked kitchen with basic spices provided. •	Dining table that seats 6. •	The master bedroom located at the opposite end of the common living area from the other two bedrooms, providing a private escape with a king-size bed, table and chairs, TV and unlimited views with direct access to the deck. The private bathroom has a step-in shower and large tub. •	Spacious second bedroom has a queen-size bed, a writing desk and a TV. •	The 3rd bedroom has 2 twin beds and a TV and shares the hall bathroom with the second bedroom. Lawn area between house and ocean but it is not fenced so presents a danger for young unsupervised children or impaired individuals. The view is amazing! Great location to SLO, Morro Bay, and Cambria. The house is great for families. Nice bedrooms and kitchen. Really enjoyed this wonderful property. The master suite is the best. Great rooms for guests. Very quiet and restful place in a fun, lazy beach town. We spent a wonderful weekend at this home! 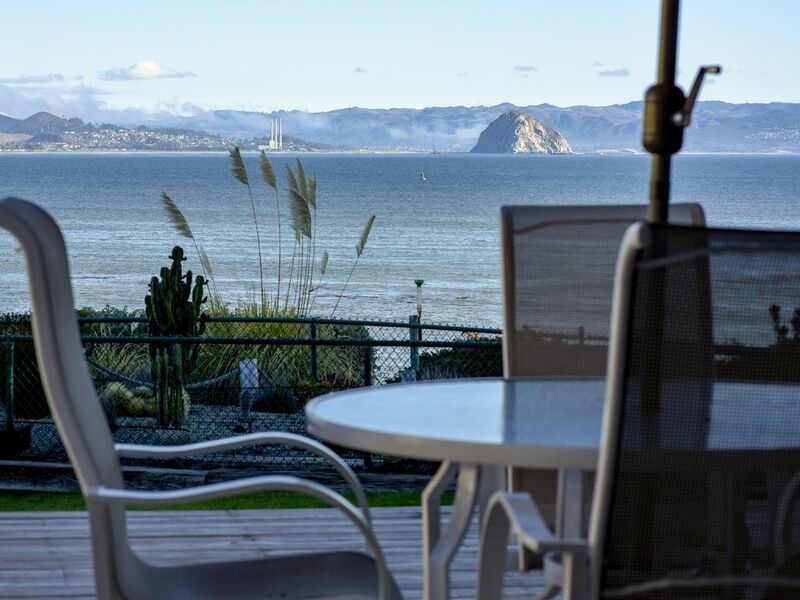 It's a very well appointed home with a marvelous view of the Pacific and Morro Rock. There were 6 adults and we spent every morning drinking coffee on the patio watching the water. So peaceful. In the evening we would walk to the Cayucos Bluffs for a spectacular sunset, about a minute walk to the north (west?). Met the neighbors and had a great chat. The house is about a 1/2 mile from Cayucos restaurants. The first night we walked but the second night we took Uber for about 6 bucks. Try the Cass Grill. It's amazing! We will definitely stay here again. The property actually looked better than in the photos. It felt very spacious, was immaculate, and the view was simply spectacular. Highly recommend! I had 4 people share this beautiful home for a Birthday Weekend. It was clean, beautiful, and the view was incredible. We love to cook and the kitchen was well stocked with equipment that allowed us to truly enjoy the weekend culinary experience!!!! Breathing taking views! Extremely spotless clean inside! This is the best beach house we've ever stayed in. Absolutely perfect! The views are amazing. The house is so comfortable and beautiful. We shared Christmas memories that are priceless. Without any hesitation, I recommend to anyone considering staying here to do it. You won't be disappointed! The Central Coast is an incredibly beautiful part of California that offers many recreational opportunities or just a serene place to relax and rejuvenate. The scenic coast line meets rolling hills in an unparalleled combination of natural beauty. Spend the day kayaking in Morro Bay, wine tasting in local wineries, strolling the local beaches, or just sitting in the living room watching the tide go in and out. We promise you won't be disappointed!